ISP says its new service is “tailor-made for suburban America,” but infrastructure requirements mean metropolitan and rural areas will be passed over during early deployment. Vivint, a significant player in the connected home and residential solar panel markets, is adding Internet service to its portfolio of consumer offerings. The company is going after the telcos and cable companies with an innovative wireless service that delivers speeds of up to 100Mbps—up and down—for just $60 per month. That’s far from the gigabit per second that fiber can deliver, but it’s much faster than DSL or satellite, and it’s a whole lot cheaper than fiber. Why this matters: The United States lags behind a number of countries when it comes to Internet access, speed, and cost. The culprit: lack of competition. In most areas, consumers are lucky to have a telco and a cable company to choose between. In rural areas, there’s often only one choice—and it’s usually not a fast alternative. In the absence of competition, Internet service providers have no incentive to keep prices low or to improve service. Vivint is not only a new competitor, it’s deploying new technology that doesn’t rely on existing neighborhood infrastructure, such as telephone lines or coaxial cable. Nor does it involve tearing up streets to lay new wire or fiber. These advantages could help the company rapidly expand its service to new areas, although the wireless technology it has developed does have limits. 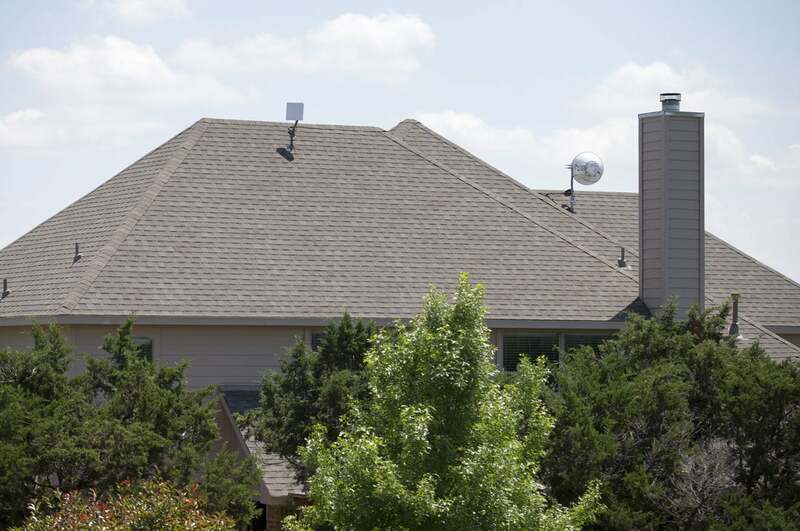 In Vivint’s system, a “hub home” relays Internet service to as many as 24 “customer homes.” In exchange for hosting three antennas on their home’s roof (the third one doesn’t appear in this photo), hub-home owners get free Internet service. Vivint is using LMDS (local multipoint distribution service) radio technology to deliver its service. The company utilizes licensed spectrum in the 28GHz frequency band, using radios mounted on cell-phone towers or tall buildings. 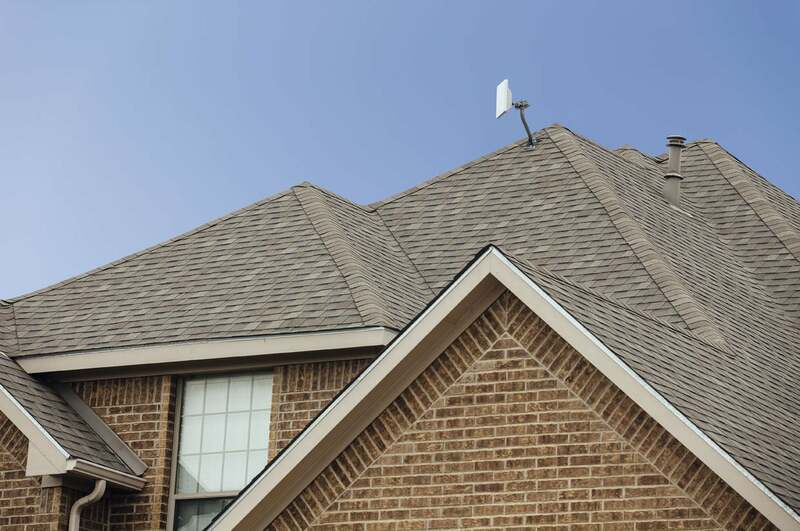 These radios are hard-wired to fiber connections, but connect wirelessly to antennas on what Vivint calls “hub homes.” Hub homes belong to customers who allow Vivint to install three radios on their home’s roof. One radio connects to the radio on the tower, and the other two are proprietary access points that provide Internet service to the hub home and up to 24 other homes within a 1000-foot radius (two access points are needed because each one has an antenna providing 180 degrees of coverage; two antennas deliver 360 degrees of coverage). Each radio tower can in turn support up to 100 hub homes. In exchange for tolerating all those antennas on their roofs, Vivint gives its hub-home customers free Internet service. 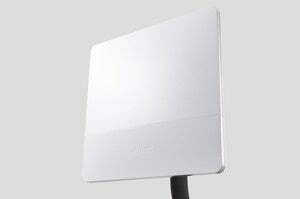 Paying customers will also need an antenna on their roof, which is then hardwired to their router using CAT5e ethernet cable. Langford says Vivint installers do their best to conceal the cable, but it will run along the exterior of the home much like a satellite-TV cable would. A wall plate with an ethernet port is installed where the cable enters the home, ideally near the customer’s router. Vivint will provide an 802.11ac router to customers who don’t have one, but the company will also work with existing equipment if that’s the customer’s preference. Vivint-branded routers have customized firmware that makes it easier for their tech-support personnel to troubleshoot, but the rest of the device is based on standards, according to Langford. The cables from Vivint’s rooftop antennas are routed along the exterior of the home, but Vivint says its installers will do their best to conceal the wire. WISPs (wireless Internet service providers) are typically regional players serving a limited territory, and that describes Vivint Internet today. The company provides service to scattered locations across its home state of Utah, and it recently expanded to El Paso and San Antonio, Texas. But the company has aspirations to serve the entire country. “We chose El Paso because it’s a warm market,” Langford said. “Our to-market strategy is to knock on people’s doors and get them to switch. When the weather is warm, it’s easier to knock on doors. We chose San Antonio to show that we’re not just working in the desert. And we wanted to show that we could compete with AT&T and Time Warner Cable at their best. We’re going anywhere we think consumers are looking for an alternative ISP.” Langford said the company expects to expand into three more markets before the end of 2015, and several more after that. Langford declined to say which areas of the company Vivint planned to target next, but he said customers could petition for service by signing up at Vivint Internet’s website. What do you think of Vivint’s Internet service? Would you trade rooftop real estate and the visual detraction that goes with it for free Internet service? Let us know in the comments section, below. Update: The answer to one of my fact-check questions came in after this story was originally published. Vivint Internet service requires a two-year contract, with an early termination fee of $10 per month remaining on the contract. So, for example, if a customer terminates his or her contract six months early, it will cost them $60 to do so.